Anytime I hear the word, “boardwalk”, I am immediately reminded of The Drifters’ song, “Under the Boardwalk”. While that song takes me to a place of sun and fun, being with loved ones and sets up a beautiful mental image of beaches and boardwalks, it doesn’t get into a lot of detail about actual boardwalks. So, while this song might quietly play in your head as you continue to read this post, let’s dive a bit deeper into the inspiration behind this song: the boardwalk. By definition, a boardwalk is a walk constructed by planking or a walk constructed along a beach. This definition is fairly vague. Boardwalks serve a very specific purpose: a walkway or path over sand and wet areas including marshes and beaches. The first boardwalk was built in 1870 in Atlantic City, New Jersey. The Atlantic City Boardwalk has gone through many repairs and renovations due to weather-related incidents and increased popularity. Today, the Boardwalk spans over 4 miles long and over 60 ft. wide. Over the years, boardwalks all over the country have become popular tourist destinations. From Atlantic City to Santa Cruz Harbor, boardwalks are pathways to fun, entertainment, dining and amusement parks. Both the Atlantic City Boardwalk and the Santa Cruz Harbor Boardwalk were constructed using wooden timbers in a “herringbone” pattern, which is ideal for biking. Last year (2017) alone, the Atlantic City Boardwalk hosted over 200 shows and welcomed over 80,000 visitors. There are many different ways to construct a boardwalk. Common building materials are concrete, wooden timbers and metal. Another building material that is used is composite plastic lumber. Depending on the material, the method of construction varies a bit. Two main components to building a boardwalk include a substructure to help level the ground and provide a level boardwalk surface, distribute weight evenly and keep the top of the boardwalk out of direct exposure to water. Boards or concrete are laid over the substructure to provide a sturdy top to walk, run and bike on. When designing a boardwalk, considering the location, environment and usage is important. Often times boardwalks receive heavy foot traffic, see all types of weather conditions and are located in wet environments. It’s important to understand these factors when designing, planning and building a boardwalk. Choosing a material that meets all of these requirements for your specific project and environment will increase ROI (return on investment), drive profitability and increase the lifespan of the boardwalk. Wooden timbers will rot, degrade and splinter over time. Metal will corrode and rust with all of the water exposure, and concrete will crack and break apart when it sees one extreme weather condition to the other. Plastic lumber, however, will not rot, degrade or corrode. It requires no painting or staining, and does not absorb moisture and is impervious to marine borers like wood, metal and concrete do. Understanding these benefits before planning a boardwalk project can save loads of time and money. 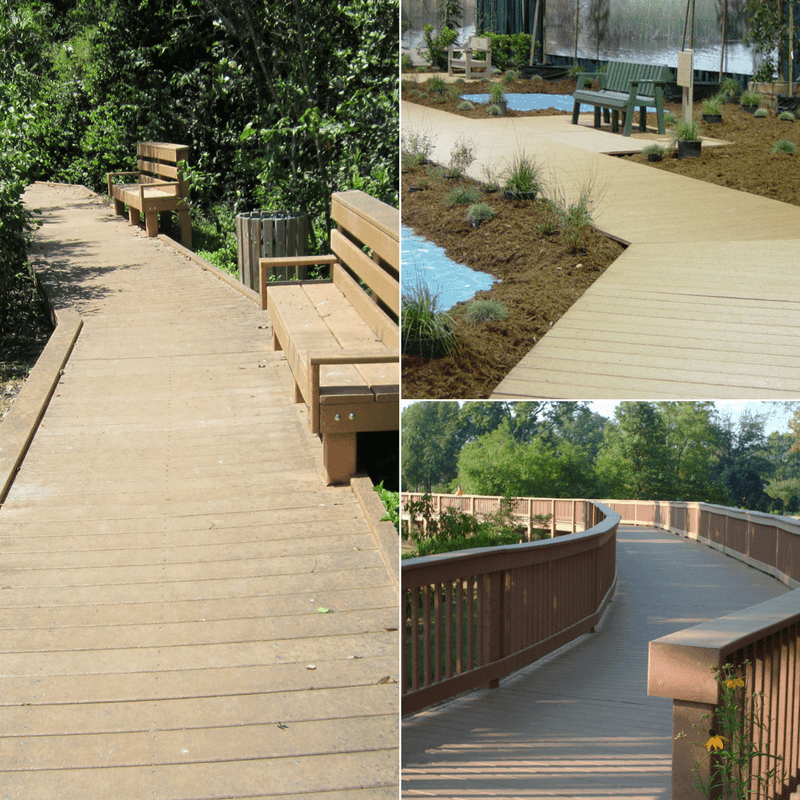 Here are a few examples of how plastic lumber can work for your boardwalk applications. Want to Find Which Product is Right for Your Boardwalk? Request samples of our premium structural plastic lumber and start your project today!